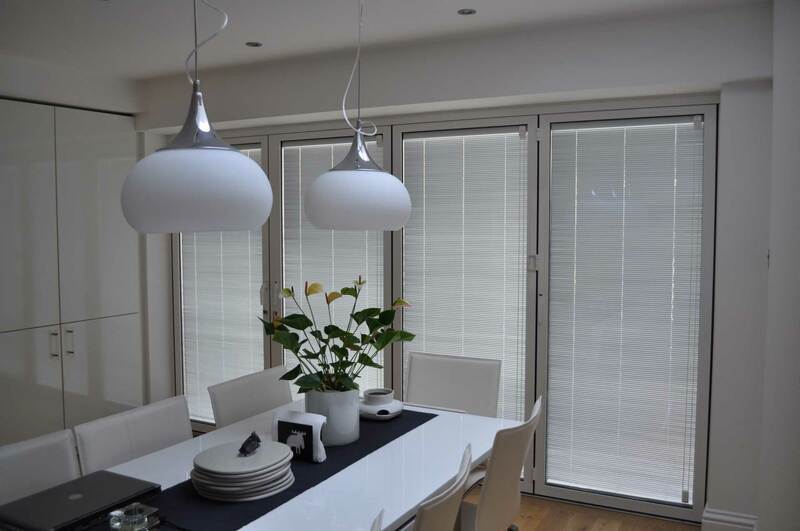 Integral blinds are practical, they look stunning in any setting, and are extremely easy to clean - they'll even stop your furnishings from fading. Find out more by getting in touch with the Fox Windows & Doors today. Integral Venetian blinds installed by Fox Windows & Doors are manufactured by Morley Glass. Our integrated blinds will regulate temperature and prevent sunlight from harming your furniture. Our integral blinds are suitable anywhere in your property such as a kitchen extension, orangery or conservatory. No cleaning is required and a choice of modern designs are available, so you’ll be able to make sure your fittings suit their immediate environment. Fox Windows & Doors fits integral blinds for customers in Kenilworth, Warwickshire, Leamington Spa and the surrounding areas. We have a strong local reputation and can fit your blinds as part of a wider spanning home improvement project. Call us today for details and integral blinds prices. Integral blinds are suitable for any application. They excel at providing protection against adverse weather conditions and dirt and have been designed to work with bi-fold and patio door arrangements. Our designs will keep your home warm and require almost no upkeep. If your conservatory - or a room in your house - comprises two spaces, then Venetian integrated blinds can be used to screen off the two spaces. This means you can enjoy privacy when needed but also link two adjacent areas together when convenient. Contact our experienced team for further information about this option. The Venetian style is ideally-suited to homes with conservatories, orangeries or house extensions. Bi-fold doors are frequently used to create access points into gardens in these sorts of structures - and, in cases where lots of glass is used in the design, integrated blinds are a great way to maintain privacy when required. Choose a colour for your integral blinds that best fits in with your chosen schemes. A selection of Venetian slats is available if you want to further refine the appearance of your home, conservatory or extension. Find a look that will match your home - whatever its age, shape or size when you choose Fox Windows & Doors. Our Venetian blinds can be retrofitted. If you want to control the temperature in your home or garden room, our integral blinds can be fitted after your doors have been installed. Find out how we do this by calling or emailing our team, so that we can explain how this simple process works. Our integrated blinds are the perfect solutions for homes featuring bi-fold doors. This is a product that is permanently sealed into the unit, which means you’ll have complete control over how light or dark your home is. These integrated blinds can be manually or automatically operated using a range of different control systems. When you choose our Venetian integrated blinds, you’ll be able to control how much light you let into your home. Several manual options are available, including magnetic, sliding and cordless systems. Your product can also be operated by solar power or magnetic mechanisms for greater ease and convenience. Even the most advanced glazing technology will let some light in. If you want to further reduce glare and heat in your room or extension, choose integral blinds. Once closed, sealed units with blinds inside will keep your chosen space cool and shady – leaving you to relax in comfort until the weather outside is more agreeable. Integrated blinds from Fox Windows & Doors can be installed into your home. Call for details and competitive prices. Call us for advice about choosing the best product for your home. We offer internal blinds for bi-fold doors, windows and more in Kenilworth, Leamington Spa, Warwickshire and surrounding areas. We can also act as a one-stop for all your home improvement needs. If you’re looking for the cost of integral blinds for your double glazing, get in touch with us today.